MORE FEATURES. MORE FARMING. INTRODUCING THE ALL-NEW T6. There are no shortcuts to success. That’s why we engineered the T6 with more than 20 new, innovative features. With best-in-class power for unrivaled performance, Comfort Ride™ cab suspension for maximum productivity and the high-visibility Horizon™ cab for unmatched efficiency, the T6 was built to stand out and outperform. Because at New Holland, we believe that a long, hard day in the field doesn’t have to feel like one. That’s New Holland SMART. T6 models range from 95 to 125 PTO horsepower, in packages to suit your needs. Value. This package is perfect for basic haying needs and chores. Plus. This configuration offers increased performance and comfort for haying and loader operations. Elite. This package includes high- performance and luxury features and is available with a faster 31-mph (50 kph) transmission option. Auto Command™. This configuration is the ultimate hay and chore tractor with deluxe features and the highest performance, including a faster 31-mph (50 kph) transmission option. Operator comfort and ease is directly related to productivity. That’s why newT6 Series tractors continue New Holland’s tradition of innovation with features that make your work more comfortable. LED work lights are standard equipment on all T6 models, providing exceptional illumination for productivity and safety during after-daylight operation. Value models are equipped with 8 LED lights standard to deliver 15,600 lumens—that’s 77% brighter than the 8 halogen work lights used on previous T6 tractors. T6 Plus, Elite and Auto Command models come standard with 12 LED lights, with up to 16 available to make it more than 3 1/2 as bright. The name “Horizon cab” is inspired by the exceptional visibility you enjoy from inside. With 63 square feet of glass, you get a great view in all directions. You even get a view through the high-visibility roof panel—perfect for viewing a raised loader bucket. New Holland has reduced noise levels to as low as 69 decibels. Dual-zone air conditioning keeps you cool on the hottest days. Add Automatic Temperature Control and your T6 tractor maintains the temperature you set. You also get an enhanced instrument panel and your choice of new air suspension seats. Select a T6 tractor equipped with optional Comfort Ride™ cab suspension so you enjoy an extra-smooth ride over uneven fields or bumpy roads. This simple mechanical system uses two rubber isolators at the front corners of the cab, and a sway bar and two spring-loaded shock absorbers at the rear of the cab. 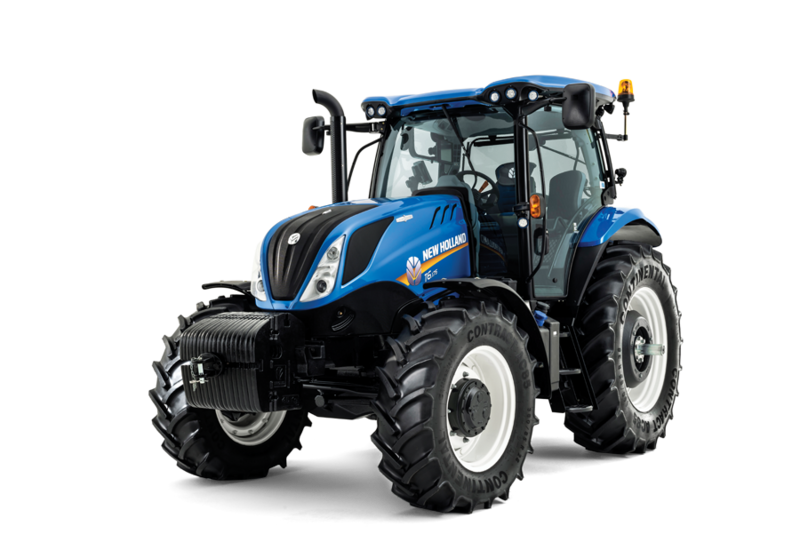 These tractors continue the New Holland tradition of easy servicing and a long oil change interval that leads the industry—600 hours. For a longer time between fueling, you can augment the ample 52.2-gallon fuel tank with a new auxiliary modular fuel tank that expands fuel capacity to 58.6 gallons—enough fuel for a 12-hour day or more. The T6 tractor hood glides open for easy access to engine and components. New Holland gives you choices when it comes to the T6 hydraulic system. T6 Value models come standard with a fixed-displacement, open-center hydraulic system with 21.1 gallon-per-minute (GPM) gear pump and a separate 12.4-gpm steering pump. If you require more hydraulic capability, select the closed-center, load-sensing (CCLS) hydraulic system. It’s ideal for more demanding implements. The system includes a 29.9-gpm variable displacement piston pump for the rear remotes, three-point hitch and loader (if equipped) plus the 12.4-gpm steering pump. T6 models with the Auto Command™ CVT come with a 33-gpm CCLS hydraulic system. Standard lift capacity at the three-point hitch is 8,388 pounds for Value tractors, 9,213 pounds for T6 Plus and Elite tractors and 11,649 pounds for T6 tractors equipped with Auto Command™ CVT. For Elite and Auto Command T6 tractors, a front three-point hitch is available, providing a lift capacity of 6,834 pounds. New T6 Series tractors are designed to make tractor operation and roading more productive and more comfortable. In automatic mode, the TerraLock™ system manages front and rear differential engagement to deliver tractions when needed, and disengages automatically for tighter turns. T6 ride smoothness is already impressive due to the long wheelbase and Comfort Ride cab suspension option, but you can enjoy ultimate ride smoothness with the TerraGlide™ FWD axle option. It offers a longer 106-inch wheelbase plus up to four inches of travel, for better stability, control and drawbar pull. The SuperSteer™ axle increases turn angle from the standard 55 degrees to 65 degrees so you can make sharper, faster turns, decreasing headland turn time by 35%. You get shorter turning plus the benefits of the even longer 110-inch wheelbase.